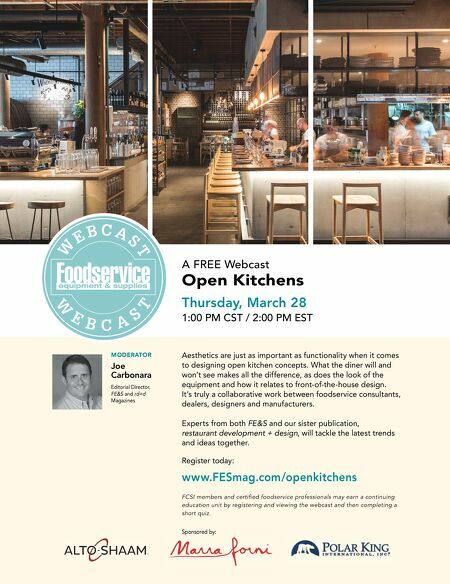 118 • FOODSERVICE EQUIPMENT & SUPPLIES • FEBRUARY 2019 market spotlight development, who works for Elior North America. Fairmont State's foodservice team had long sought to provide Mexican dishes in a fast-casual format — a challenge various operators face. For Kellner, the answer came from a visit to Mexico City. There, he tasted authentic recipes, learned how this food was eaten and experienced firsthand how it was pre- sented to customers. "Chilaca is a bit more authentic than Tex-Mex, and that was the goal," says Kellner. That authenticity comes from the traditional Mexican recipes and ingredients. "We spoke with college students and conducted scientific research as well as informal discussions, and it was evident that higher- education students are looking for fast-casual Mexican food," he says. "That's where our growth is." Kellner's comments connect to the larger trends around more regional, authentic cuisine. The creativity comes in how operators connect the dots between regional and au- thentic and the bigger-picture Mexican segment. For exam- ple, Texas is well known as the home of Tex-Mex, but there is a fine line between this cuisine and authentic Mexican fare. "The uprising in the '70s and '80s between Tex-Mex and Mexican cuisine was powerful and revolutionary for this area," says Rick Lopez, executive chef at La Condesa in Aus- tin, Texas. "Today, the cuisine is more inspired by Mexican culture and speaks volumes about the chefs who honor it." The 2,456-square-foot, 184-seat restaurant focuses on modern Mexican, which blends traditional Mexican dishes with Southern fare. This includes dishes like Tostada de Atun with yellowfin tuna, pickled cucumber, crispy shallot, chipotle mayo and habanero mustard; and Tamal de Camote with sweet potato tamal, mole amarillo, grilled greens, tomatillo and herbs. "We're blending cultures," says Lopez. 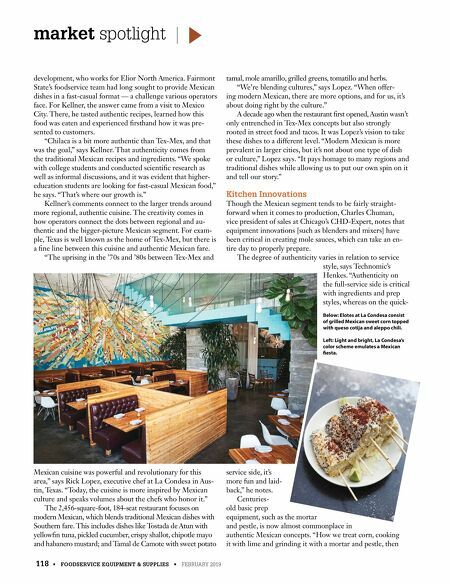 "When offer- ing modern Mexican, there are more options, and for us, it's about doing right by the culture." A decade ago when the restaurant first opened, Austin wasn't only entrenched in Tex-Mex concepts but also strongly rooted in street food and tacos. It was Lopez's vision to take these dishes to a different level. "Modern Mexican is more prevalent in larger cities, but it's not about one type of dish or culture," Lopez says. "It pays homage to many regions and traditional dishes while allowing us to put our own spin on it and tell our story." Kitchen Innovations Though the Mexican segment tends to be fairly straight- forward when it comes to production, Charles Chuman, vice president of sales at Chicago's CHD-Expert, notes that equipment innovations [such as blenders and mixers] have been critical in creating mole sauces, which can take an en- tire day to properly prepare. The degree of authenticity varies in relation to service style, says Technomic's Henkes. "Authenticity on the full-service side is critical with ingredients and prep styles, whereas on the quick- service side, it's more fun and laid- back," he notes. Centuries- old basic prep equipment, such as the mortar and pestle, is now almost commonplace in authentic Mexican concepts. "How we treat corn, cooking it with lime and grinding it with a mortar and pestle, then Below: Elotes at La Condesa consist of grilled Mexican sweet corn topped with queso cotija and aleppo chili. Left: Light and bright, La Condesa's color scheme emulates a Mexican fiesta.